This mask has been discontinued. The Fisher & Paykel Aclaim®2 is a classic nasal CPAP mask from Fisher & Paykel Healthcare. The Fisher & Paykel Aclaim®2 CPAP mask is designed to deliver CPAP or bi-level therapy for patients with Obstructive Sleep Apnea. The Aclaim®2 CPAP mask has unique features that offer you optimum comfort while sleeping. The bias flow diffuser provides a quiet nights sleep from your cpap mask. You are sure to get the correct size with the two included Icon™ cushions provided. 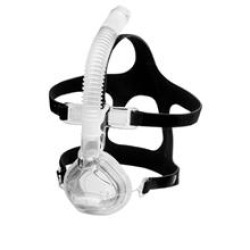 This CPAP mask can be used with any CPAP machine available. Sizes included are small and large.